On this date in 1939 in Vatican City, Roman Catholic Cardi­nal Eugenio Pacelli was elected pope on his sixty-third birth­day. His coro­nation took place ten days later. 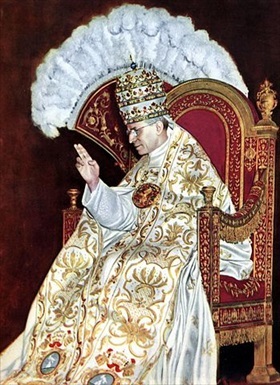 Son of a Vatican lawyer, Pacelli took the name Pius XII. Pius’ actions during the Holo­caust are contro­ver­sial. Critics have accused him of every­thing from anti-Semi­tism, to cozying up to or out­right col­luding with Fascists and Nazis, and to his failure to publicly con­demn the Nazis for the murder of Europe’s Jews. His defenders argue that his mostly silent diplo­macy saved hun­dreds of thousands of innocent victims and Jews from Nazi terror and Nazi genocide in Italy and the rest of Europe. Before being elected to the Papacy six months before the out­break of World War II in Europe, Cardi­nal Pacelli had lived twelve years in Bavaria, the birth­place of Adolf Hitler’s National Socialist German Workers’ (Nazi) Party, serving as Apos­tolic Nuncio for all Ger­many. He was well aware of the Nazis’ anti-Semitic prac­tices and their extraor­di­nary pen­chant for bru­talizing their enemies. Reacting to wide­spread criti­cism of the Vati­can’s con­cor­dat with Hitler’s govern­ment in July 1933—an agreement that he, as then-Vatican State Secre­tary, had been instru­men­tal in drafting—the future pope pri­vately told the Brit­ish ambas­sador in Rome that the Catho­lic Church deplored the actions of the Ger­man govern­ment at home, their per­se­cution of Jews, their pro­ceeding against poli­ti­cal oppo­nents, and the reign of terror to which they subjected Germany and Austria. Between 1933 and 1939 Pacelli issued fifty-five protests of vio­la­tions of the 1933 Reichs­konkordat. Put simply, tensions between the Holy See and the Nazis have a long history. In his first encyclical letter as pope, issued a month and a half after the German inva­sion of Poland, Pius XII called for the restora­tion of that coun­try’s inde­pen­dence, denounced racism, and called for love, com­pas­sion, and cha­rity to pre­vail over war. For much of the war, Pius main­tained a public front of neu­tral­ity, indif­fer­ence, or silence while German atro­cities were com­mitted out­side Italy. Privately and occa­sion­ally publicly the pontiff inter­ceded to help Jews; for example, in July 1944 he pushed the Hunga­rian regent, Adm. Miklós Horthy, to cease his govern­ment’s depor­ta­tion of Jews to Nazi death camps. When the German SS (or Schutz­staffel, the elite mili­tary unit and special police force of the Nazi Party) began fer­reting out Jews from inside Italy in 1943 in places where the Wehr­macht (regular German armed forces) held sway, such as in Benito Mussolini’s so-called Republic of Salò in North­ern Italy, Pius XII directed the Catho­lic Church to make sub­stan­tial efforts to save Italian Jews. In the end, four-fifths of the Jewish pop­u­lation of Italy escaped slaughter—a remarkable record of moral courage. Left: Pacelli, Apostolic Nuncio (ambassador) to Bavaria (1917–1925), is seen paying a visit to a group of bishops in 1922. 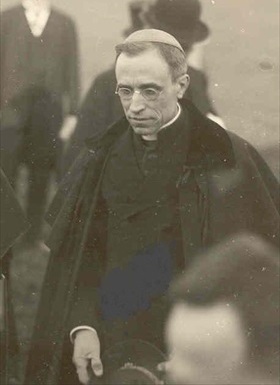 Pacelli was simultaneously Apostolic Nuncio to Germany (1920–1930). 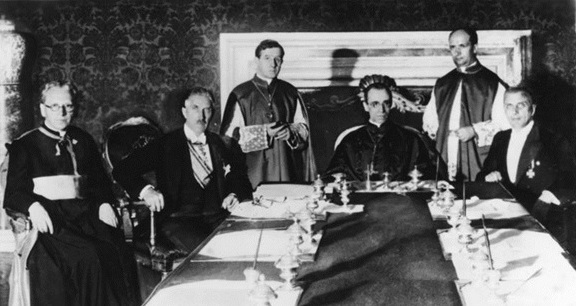 Right: Pope Pius XII on his day of coronation, March 12, 1939. Pacelli (1876–1958) took the same papal name as his prede­cessor, a title used exclu­sively by Ital­ian popes. When Pacelli was elected pope, the Nazi regime registered strong pro­tests and called Pius XII the “Jewish Pope” because of his earlier condemnation of German race laws.